After a memorable trip through the Greek islands last year, you have been quite eager to repeat the effort this summer, as there are thousands of islands just begging to be conquered by your footsteps. With the bargain holidays in Greece offered by travel companies like COSMOS making getting there and back a cinch, the only thing left to do is to figure out where your base/starting point will be. After much deliberation and a brief moment where you considered throwing a dart at a map, you have decided to begin Greek isle crawl 2014 in Kos. Being within spitting distance of Turkey, it has been at the centre of a great deal of history over the eons, and it plays host to some heaving parties in the present day. Being a holding in some of the greatest empires in the history of the world, Kos has its share of historical relics that serve as a window into its storied past. The Castle of the Knights is one of those stone and mortar legacies, whose massive walls stood tall against many invaders until the unstoppable Ottoman juggernaut overwhelmed it. There’s the tree under which Hippocrates taught his students (probably replanted since then, but suspend your imagination…), as well as a score of temples, archeological sites, and museums that will occupy you for at least a couple of days. It’s incredibly easy to do, given the generally flat topography of Kos. With rentals available for four to five Euros per day, the authentic neighbourhoods, villages and far flung ruins of this island are well within easy reach, all without draining your bank account at an alarming rate. While Kos has plenty of charms waiting to be experienced, it doesn’t change the fact that there are thousands of islands out there that won’t discover themselves. To help remedy this troubling fact, there are boat tours that will take you out to visit and view the innumerable isles that are uninhabited in Greece’s Aegean archipelago. Be sure to pay attention, as you’ll be picking your secret getaway where you’ll hide away from the world for the rest of your days once you have had it with the rat race, once and for all! While a backpacker’s biggest issue is getting the scoop on a place’s story and culture, you can only ignore those picture perfect beaches for so long. 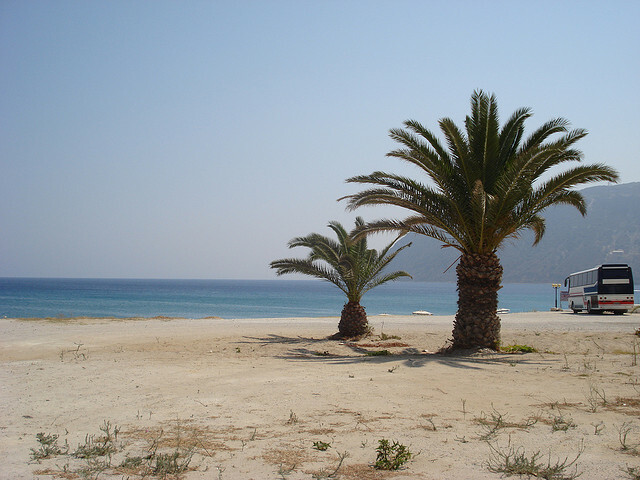 The aptly named Paradise Beach is always a good choice, with its six kilometres of blissful solitude and its mix of pine and palm trees, while those looking for a more social beach will like hanging out at Tigaki, where restaurant and beach bars in the immediate vicinity will keep you plied with excellent food and booze. With multiple clubs playing the latest hits, and no shortage of attractive Scandinavians milling about (Kos is a popular destination for this demographic), going out on Kos can be a fun affair. Deals abound, especially in the high season … all you have to do is walk down the street between the port and the ruins in Kos town and you’ll get inundated with them (e.g. 2 beers AND 2 shots for six Euro). This summer, scores of travelers will descend upon the Aegean. By starting in Kos, you’ll kick off your adventure right in the heart of the action!